No transcoding necessary. We essentially just unwrap the PVR files and put them on discs. Saves time and quality. Easier playback. Practically everyone has a DVD player these days and for many, popping a disc in would make much more sense than messing about with some media streaming solution. This is also a good method for backing up to hard drives because a DVD is a standard format and we can always compress it more later. There’s 3 stages involved - splitting the AVR files up into video, sound and subtitle data, authoring the DVD (putting all of that stuff together, but in a different way) and then burning the actual disc (or saving the image file). The first one is easy - we use ProjectX (mentioned here before)which, being a pure Java app, runs exactly the same on any JRE-supported platform. The authoring process is a bit more involved. We’ll have to take the output from ProjectX, put it together again, do special voodoo in case of subtitles and then actually author the VOB files and DVD folder structure. Burning is of-course a piece of cake for which we have many good free and commercial alternatives to choose from. Bring your AVR file into ProjectX (File > Add or D&D). Click on CutControl if you want to trim your source or remove ads. Just remember you’re marking the regions you want to keep, not remove (the green bar). The particular broadcaster who’s material I’m testing this with alternates between 16:9 and 4:3 aspect ratio between the show and ads so I leave one extra black frame after the ad finishes, which is where they switch back to widescreen. The way I’ve understood it, there’s two ways of transferring subtitles in digital TV - teletext and DVB native encoding. To use the former (which is more popular among satellite broadcasters), click PreSettings > Subtitle > “re-build TTX-PTS from 1st MpgAudio Stream” (Image 1). DVB subs can be either baked into the video (easier to use for us, but can’t disable them or change the language) or bitmaps that are then layered on the video (more flexible but much more difficult to handle). Check below on how to handle the layered version. Click on prepare>>, make sure “demux” is selected and hit the big Play/Pause button. You can burn that with any burning app that knows what UDF stands for. I tested this with Burn and it worked fine, as long as you didn’t use the Video tab, but selected Data > DVD (UDF) and dropped the contents of folder “movie” (AUDIO_TS and VIDEO_TS) into the file list. Most PVR devices have a file size limit of 2 GB, which at 5Mb/s (+224kBit/s audio) is just around (16000⁄5,224⁄60=51) minutes worth of show so longer ones will be split into separate files. Luckily this is not a problem as mighty ProjectX handles can handle split material per collection. Just drag the pieces in, make sure they’re in the right order. 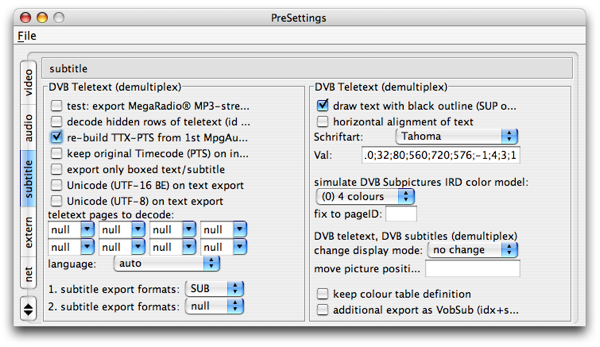 Using those separate DVB subtitle tracks can be tricky because ProjectX rips subtitles into SUP files, which currently has no Mac native editor. I even tried DVD Studio Pro, which didn’t do anything (kind of a silly idea, I know). I tend to record more “obscure” material like foreign (French, Russian etc) films and documentaries and so subtitle support is essential. There’s two pieces of good news however - I think I’ve found a way to use SUP files on the Mac and in my testing I’ve found that many broadcasts actually have the subtitles already encoded into the video, so no additional processing is required.